Later this summer, the all-new Toyota Auris will hit Howards Group’s Western-Super-Mare showroom in both hatchback and estate models. This is the mid-point of the Auris’ lifecycle and the model is the latest to get a thorough refresh. 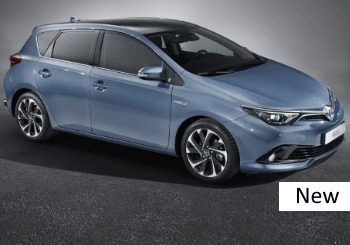 Although the Auris’ styling will be less comprehensive than the recent efforts on the Avensis and Yaris, the front end will look significantly different, with a reshaped grille, new headlights and re-sculpted lower bumper. The car looks a little longer, too, with bigger overhangs, and the back has been restyled with a new tough-guy bumper, LED lights and a nice neat chrome strip. The interior looks suitably refreshed, too, with a new dashboard, improved lighting and a nice finish and shape on the textiles. Making its debut in the cabin on the Hybrid model and upper-end trims is a slick 4.2in touchscreen. There’s improved steering and suspension and steering, so the ride and handling are a positive delight, and there’s now less road noise inside the cabin. What kind of equipment can you expect? The full spec isn’t out yet, but models will include the Design and Business Edition. Toyota is also including excellent safety and comfort features, in the shape of the Toyota Safety Sense Pack. With this, you’ll get a lane-departure system, pre-collision system, road sign assist and automatic high beam lights. You can pick from two new engines alongside existing units: the 1.2-litre turbo petrol and a 1.6-litre diesel. Toyota says that the 1.2 will provide similar performance to a 1.6-litre. With 114bhp, it should reach 62mph in 10.1 seconds and onwards to 104mph. You’ll be thumbing your nose at petrol stations, too, with economy of around 60.1mpg. Pick the Multidrive S gearbox and you’ll squeeze out one extra mpg. The 1.6 diesel replaces the 2.0-litre in some markets. Generating 110bhp, it will take you from 0-62mph in 10.5 seconds, with a top speed of 118mph. With a fair wind, you’ll achieve nearly 70mpg, which isn’t too shabby. Coupled with extended servicing intervals, that makes for some frugal ownership. For the environmentally minded, the 1.4 diesel is a sound choice, as it now meets Euro 6 emissions regulations, with CO2 dropping 10g/km to 89g/km. Green credentials are even better on the best-selling Hybrid, with CO2 emissions of 84g/km. Despite all these new gadgets and gizmos, the price of your new Auris shouldn’t differ too greatly from the existing version. You can snap that up for a bargain £14,945 for entry models, while £23,990 will get you top-of-the-range bells and whistles.